Thank you to Direct Energy for sponsoring today’s post and helping me share some of the ways we’re making our home a little more eco-friendly #DEsmarthome. As always, opinions are 100% my own. Around our home, we’ve made small changes that make a big difference to the environment and, in turn, our wallets. Growing up in the country created a strong connection to nature for both my husband and I. Our moms were composting long before that became the “cool” thing to do, and reducing, reusing and recycling were just part of farm life. Now, many years later, we embrace being eco-friendly and try our best to leave the smallest footprint on the environment as we can. Here’s what we do and you can too! 1) Make recycling a no-brainer by setting up a system. Our community has a blue box program, but we opt to take it to the depot on our own to save the fee. In our pantry, we have a large plastic container where all of our plastic, cardboard, metal, paper and other recyclables go. Once it’s full, it’s transferred to larger bins in the garage that are taken to the depot once they’re full. This is a great job to get the kids involved at a young age. 2) Cut down on your use of plastic. Being a former teacher, I remember how much waste was generated from students’ lunches on a daily basis. Many schools have gone to a zero garbage lunch policy, which makes me happy. Pre-packaged foods are convenient, but they’re so wasteful and usually unhealthy. 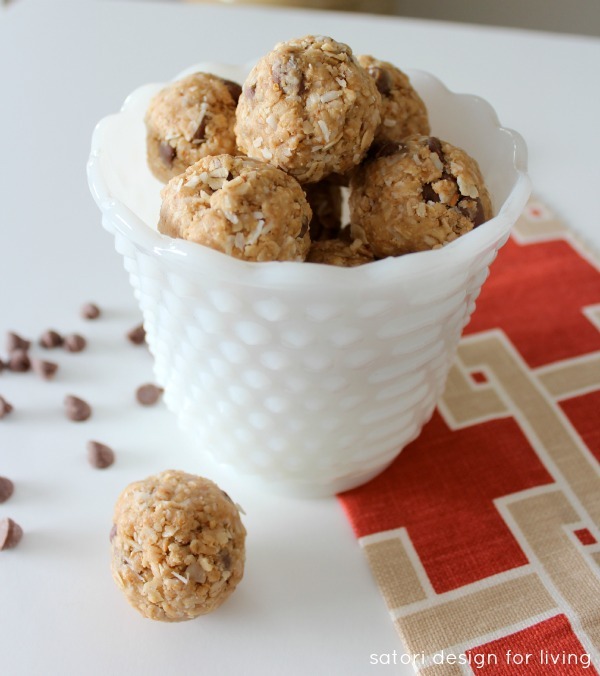 Spending an hour in the evening or on the weekend to prepare healthy snacks could potentially save you hundreds (if not thousands) of dollars a year. If you do end up using plastic sandwich bags, wash them, reuse them and, when they’re worn out, make sure they end up in the recycling bin. Even better, choose a reusable container. LED or CFL bulbs last much longer and use less energy over their lifetime. Also, get in the habit of turning off lights when you leave a room. One of my favourite things to do is to shop second hand for home decor items and furniture. I’ve scored many items at garage sales, thrift shops and even a dumpster or two. Giving something a second life like my bench helps to keep our landfills smaller! 5) Select ENERGY STAR® appliances when making new purchases. This familiar symbol makes it easy to identify the best energy performers on the market without compromising performance in any way, as certified under strict technical specifications. Our washing machine, televisions and dishwasher are all energy star rated. 6) Install a smart thermostat. Heating and cooling your home accounts for around 40% of your energy costs. We’ve selected a smart thermostat to automatically lower the temperature a couple degrees at bedtime and during the day when no one is home. It’s adjusted to be warmer when we wake in the morning or come home from work. It saves up to hundreds of dollars a year, especially when winter is harsh like this year’s. To help even more, we keep our window treatments closed during the hot afternoon in the summer and open them on a sunny day in the winter. The more you can keep the air temperature in your house comfortable without using the air conditioner, fan or furnace, the better it is for your wallet! Flowers, trees and shrubs that do well in your area will cut down on outdoor watering. 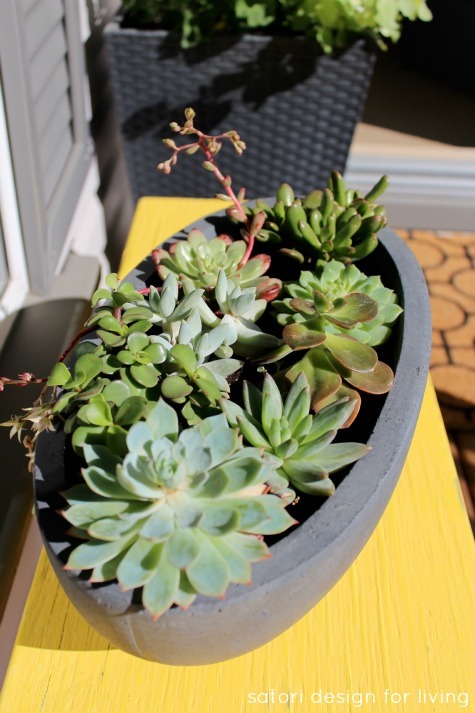 Over the past few years, we’ve turned to drought-tolerant plants like succulents and ornamental grasses so we can spend more time enjoying our yard rather than maintaining it. 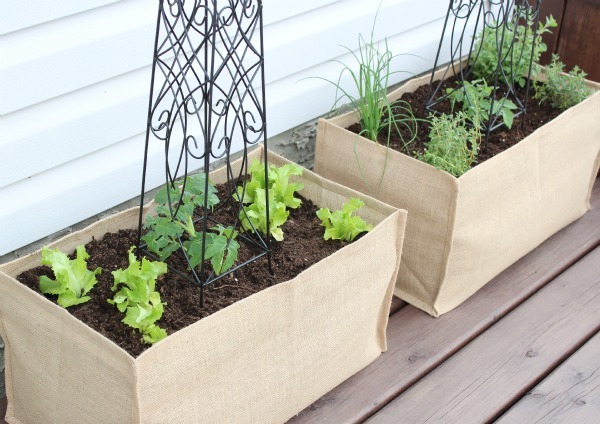 8) Create your own organic garden. Getting your kids involved in growing their own food means they’re more likely to eat healthy and be respectful of Mother Nature. If you’re short on space, a simple container garden or two can provide a bit of fresh produce all summer long with very little work. 9) Mulch your grass clippings. Most of the time we allow our mower to mulch the grass clippings and forgo bagging. Grass clippings are 80% water and decompose quickly leaving nutrients in the soil. When we’ve had a lot of rain and the grass is thick and heavy, we collect the clippings and take them to our community compost station. 10) Use an electrical timer for your outdoor lights. During the Christmas season, we schedule our lights to automatically come on around supper time and shut off before bed. This means not accidentally leaving the lights on all night long wasting power. See how you can start making changes today! Direct Energy is committed to helping their customers build a smarter home, and thus cut down on their energy usage, saving time and money. Currently, they’re offering the opportunity for anyone to learn more about creating a smarter home by visiting their Facebook page. For customers living in Alberta, Canada they offer the Comfort & Control Plan. This five-year dual fuel plan includes a fixed rate for your Alberta electricity (which won’t change for 5 years!) and flex-through Alberta natural gas with the security of a winter cap, plus a Nest Learning Thermostat at no additional cost to you (a $249 value). If you’re located in the US, check out the Direct Energy Meridian Savings Plan. With this plan you get a competitively priced fixed energy charge, up to three Honeywell Smart Thermostats (at no additional cost), plus a smartphone app that allows you to control your thermostat anytime, anywhere. I encourage you to compare these offers to your current plan to potentially save some money. To see the full details, be sure to view from your desktop, not your smartphone. Did you visit the smart tips provided by Direct Energy on Facebook? Learn anything new? 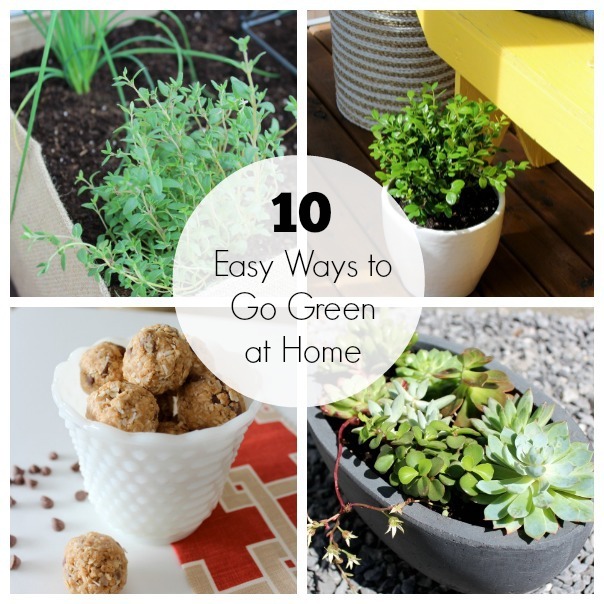 What have YOU done around your home to be more eco-friendly? Great tips, thanks Shauna. We do all of these, just some we are more diligent about… thanks for the reminders. Love the idea of zone-friendly plants. We try to choose native plants when we can, which makes care simpler and takes less water. These are all wonderful tips. What I love is that they are all so simple and doable. They can all be just part of our daily lives like you showed they are yours. Lovely and practical post! That’s the thing, small changes with a big impact! All really great ideas! I’ve been meaning to get one of those smart thermometers for awhile now. And this summer I really hope to get a mini garden started. Great tips, Shauna! Always a good topic to revisit. These are excellent tips. In the business of life, these things often get forgotten. Thank you! These are all great tips Shauna! What a great reminder that all of the little things we do can add up to big savings! I find changing out light bulbs is such an easy green thing to do! I can’t wait until things get a little warmer around here so that I can start my container garden! Great tips! I love your #4 – shopping at thrift stores and vintage shops is one of my favourite things to do, and I love that we can keep things out of landfill that way. Love that you get a Nest learning thermostat. Those things are awesome. I will have to check out their rate compared to the current one i have. Thanks for all the great tips – I love your container gardens. Can’t wait for less snow so we can do more gardening! Really great ideas! I really need to install a smart thermostat! We still have an old thermostat that you can’t program… ugh! I visited Direct Energy Canada’s Facebook page and I really love the tips they give! Love these tips Shauna! We recently just replaced our old light bulbs with energy efficient ones. Once you get passed the initial sticker shock (those light bulbs are not cheap!) you can calculate your savings in the long run. My husband always jokes about my obsessive behaviour with recycling and our compost bin. This is b/c I lived in an apartment for over 21 years and ever since we moved into a home I’ve taken full advantage of it all. Especially the having my own garden part. We grow a huge chunk of our vegetables and I am so grateful for it. Great tips Shauna!! 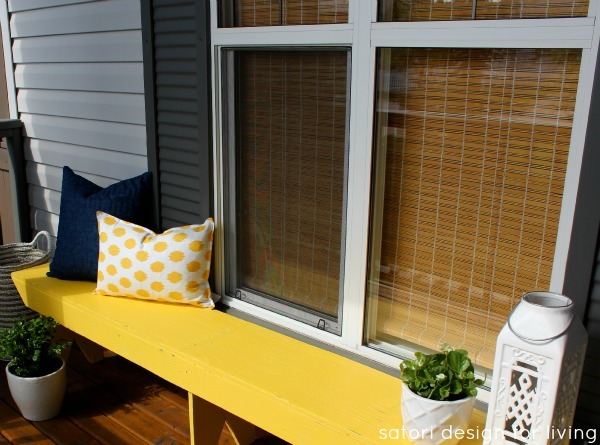 I love that yellow bench and the succulent planters. Your garden is so cute too!! great tips! Thanks for sharing this. we all need a reminder sometimes and I’m proud to say that I aim for 10/10 everyday.